After last month's Axiom AudioFile appeared (February), an attentive reader emailed me and suggested that my detailed instructions on 5.1-channel home theater speaker setup had unjustly ignored tips for stereo (two-channel) playback. He pointed out that many enthusiasts, even those with 5.1-, 6.1- or 7.1-channel home theater surround systems, still prefer listening to CDs in stereo from the two main left and right front speakers. There's nothing wrong with that. After all, it's an illusion of a musical event, a performance that originally was recorded live or in a studio that we're hoping to create in our living room. If two channels are enough to complete that illusion to a listener's satisfaction, then stereo is just fine. Certainly huge numbers of us grew up with stereo—multichannel surround sound at home is a relatively recent phenomenon in the history of recorded sound—and setting up just two speakers is a whole lot easier. Heck, I even know a moderately famous and multi-talented actor-director who is a fervent audiophile (clue: He wrote, starred in, and directed the movie “Buffalo '66”), who prefers to listen in mono. Now, that is eccentric! I've passionately advocated the enhancement in realism possible with many jazz, classical and live concert recordings played back in 5.1 channels (or more) as processed through Dolby Pro LogicII, Logic7 (H/K and Lexicon) or DTS's Neo:6, all of which extract natural ambience or out-of-phase information that existed in the original stereo recording and route it, slightly delayed, to the surround channels. But I'd certainly admit that not every stereo recording benefits. Lots of studio recordings of rock or pop music, for example, often seem better delineated, simpler if you will, played in two channels. Incidentally, most mainstream A/V receivers (Denon, H/K, Onkyo, etc. ), when switched to "Surround Off" or "Stereo," will leave the bass management in place with the subwoofer operating, unless you go into the receiver menu and re-set the menu to Subwoofer (LFE) "Off." You might also have to change the speaker size setting to "Large" if it was at "Small." It's worth checking the A/V receiver or processor owner's manual to confirm whether the stereo mode leaves the sub operating or turns off the sub and the bass management. The goal of good, two-channel speaker placement should always be a smooth, consistent, and unbroken soundstage across the front, with a sense of front-to-back depth (when it's present on the source recording; many dry studio recordings have no depth at all). Ideally, you should get a sense that some instruments extend beyond the left-right physical borders of the speakers. With careful setup of speakers with wide and consistent off-axis radiation, and a good recording, you may hear cymbals and other percussion instruments positioned somewhat beyond the speakers. The soundstage should usually not be limited to a 2-dimensional space between the speakers. You want to avoid the sense that you are getting sound from two boxes at the front of the room. That may happen when the two main speakers are too far apart. I don't like excessive physical separation: if you sit 12 feet back from your speakers, try separating the two main speakers about 6 to 8 feet. With direct-radiating speakers like the M60s, I usually angle them in very slightly towards the listening area (you may have seen this referred to on our message boards as 'toe-in'). You can tell when it's right because a vocalist will seem to appear, phantom-like, locked dead center between the two speakers. If you separate front speakers by more than 10 feet, it's often difficult to achieve an unbroken front soundstage. If you can't get a convincing solid image of a singer between the main speakers, check the polarity of your speaker connections first (the positive + wire to the + binding post; and the negative wire to the negative) and then at the receiver or amplifier. If the two main speakers are wired out of phase, a central vocalist won't lock into the center. The image will seem vague or diffuse, there will be a noticeable lack of bass, and the treble may be harsh. 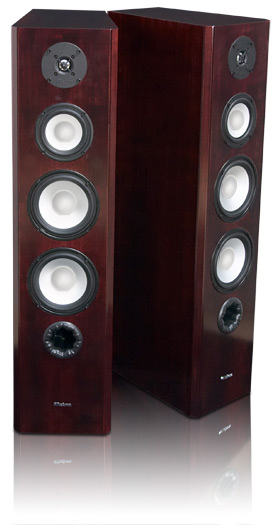 I admit that I've never tried angling floorstanding speakers upwards, but if it helps in your particular room, try it. The aforementioned M60ti owner used the spikes at the front of his speakers to tilt the speakers back a bit. A couple of washers between the rubber feet and the bottom of the cabinet would also work but you'd need to be careful about stability. Pulling floorstanding speakers out from the wall behind—you have to experiment with this—and having them unencumbered by large furniture at either side will usually aid in enhancing the 3-dimensionality of the image, especially if there are some walls to the left and right of the speaker locations (they do not have to be close). The walls to the sides contribute to early and secondary reflections from each speaker's off-axis sound output. These later-arriving sounds reach your ears a few milliseconds after the direct sound from the speaker and add to the “spaciousness” or “openness” of the presentation, extending the soundstage beyond the immediate left and right borders of the speaker cabinets. Toeing your speakers in a bit will reduce this phenomenon. You can often place bookshelf speakers surprisingly close to the wall behind (as little as a few inches) with no negative effects on sound quality. That's because bookshelf speakers do not have as extended bass response as larger floorstanding speakers, nor do they sit on the floor, so the wall behind has negligible influence. Likewise, if you wall-mount bookshelf speakers using the FMB bracket, they are immune to bass coloration from the wall behind. Another approach that is sometimes effective with a corner setup is to have the speakers firing almost across each other's paths. If you were facing the corner, the left speaker would not fire toward you but straight out from the wall; the same would apply to the right speaker. In effect, you would be sitting somewhat off-axis to each speaker's radiation pattern. It takes a bit of playing with the angles, and you may have to increase or decrease the relative volume levels of the left and right speakers using the balance control or a menu in the A/V receiver, but it can sometimes be fairly effective when interior décor or room layout prevent more ideal placement. Still, compromise is a part of life, and no less intrusive in home stereo or multichannel surround setups than in other activities. Some comments on “room treatments” are relevant. Listeners cannot expect a well-balanced loudspeaker to compensate for a barren or highly reflective room, for careless setup, or for bad recordings. Most good domestic speaker designers assume an average mix of reflective and absorbent surfaces, as Axiom does. The simple expedient of placing several area rugs (or carpeting) over a bare floor will often silence complaints of sound that is too "forward" or treble-heavy, and is far more effective in achieving smooth, balanced sound than elaborate in-room equalization programs or software. A different and valid approach to speaker setup that seeks to suppress or eliminate room reflections and boundary effects is called near-field listening. Essentially, it involves placing speakers –usually compact “bookshelf” models because the floor is a room boundary with its own effects—on stands almost in the middle of a room and sitting so close to them that reflections from room surfaces become insignificant. Lots of recording engineers use this approach when two small speakers are balanced on top of the recording console only a few feet from the engineer's ears. Near-field listening isn't very room-décor-friendly but it can be satisfying in its own way, sort of like headphone playback without the peculiar inside-the-head imaging that headphones yield. Some of the “treatments” advocated for recording studio control rooms in which virtually all the wall surfaces are highly absorbent accomplish much the same thing. In all of this discussion, no matter how you set up your speakers—and really good speakers make it a whole lot easier for the illusion to take hold--it's still the quality and realism of the music playback that matters. We talk of being “blown away” by a great experience. That's it exactly: the transcendent power of the musical illusion to sweep us into another reality and away from everyday life.